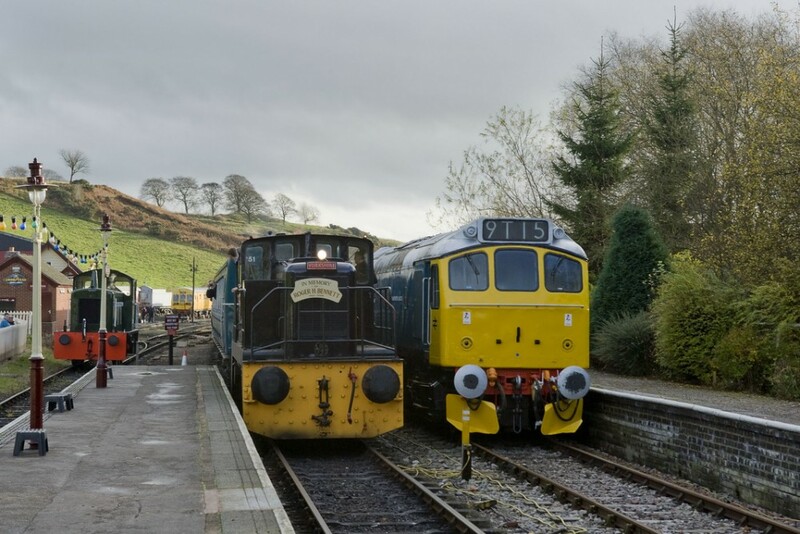 The Churnet Valley Railway has a number of diesel locomotives onsite, and from time to time features guest locomotives appearing from other railways from around the UK. 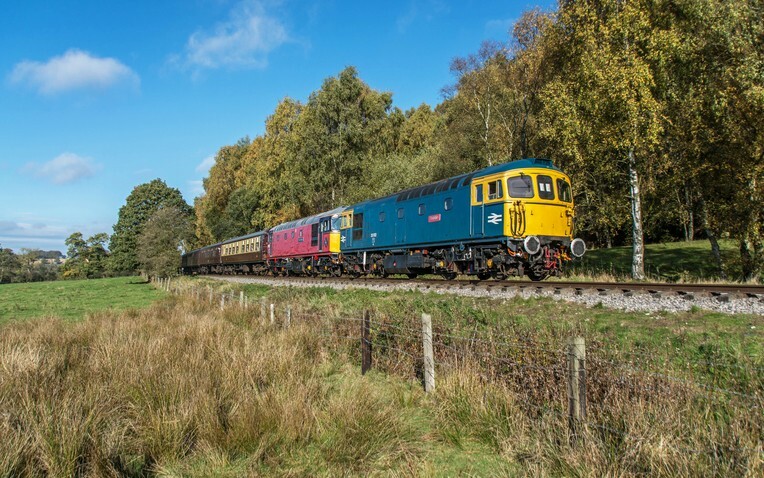 Below is a bit of history of the locomotives currently regarded as resident on the Churnet Valley Railway, with the proposed roster for the selected diesel turns on the Churnet Valley Railway in 2017. BR Class 25 no. 25322 "Tamworth Castle"
BRCW Class 33 nos. 33021 "Captain Charles / 33102 "Sophie"
YEC Janus no. 2748 "6 Roger H Bennet"
Starting life as D3800, the 08 was built at Derby locomotive works and entered traffic in Dec 1959 being first allocated to Stoke shed (5D),resplendent in British Railway’s corporate Railways Green with Yellow and Black wasp stripe ends. Except for a short visit to Lancaster Green Ayre depot in 1960, plus a brief stint at Crewe, D3800 remained at Stoke until November 1967 following the full closure of 5D. From here she was reallocated to Crewe, where apart from a spell at Doncaster, the loco remained for the remainder of the 20th Century. In February 1974 she was renumbered to 08633, and at some point received the new corporate livery of BR Blue. As one of the Crewe based parcels shunt engines, it was repainted into the Red and Grey livery of its parent sector identity and was named "The Sorter" at Crewe Oct 1991, a name it was to carry until November 1995. 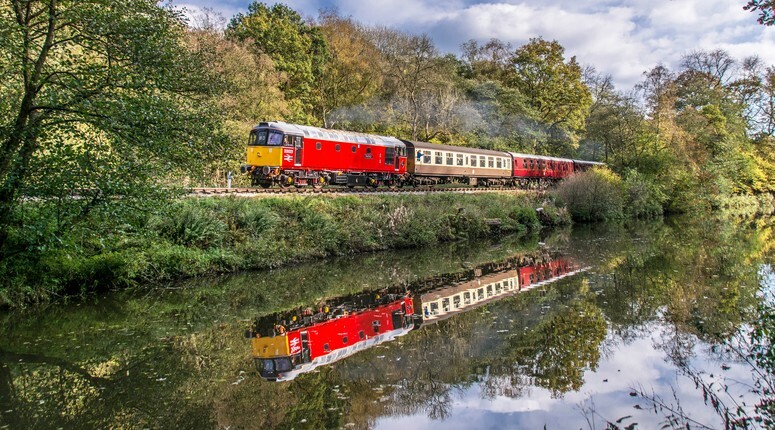 Privitisation saw the loco transferred into the ownership of English, Welsh & Scottish Railways (EWS) and in the early 2000s another repaint was to happen – this time in to the Red and Gold livery of EWS. A spell as depot shunter at Worksop Wagon Repair Depot followed before 08633 was moved to Toton in December 2009. 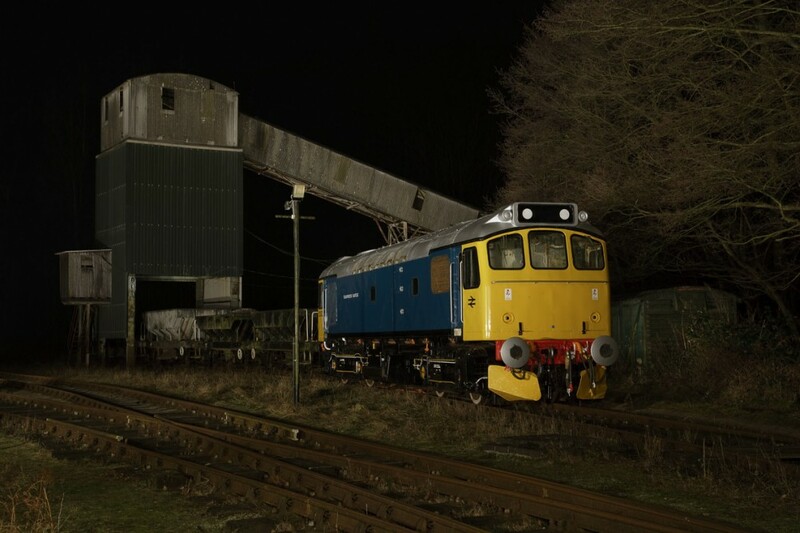 February 2010 saw the loco fitted with remote control equipment, enabling it to be driven remotely from the ground, and on the 17th March 2010 the loco was moved to Hinksey Yard, before being transferred to Bescot in August of the same year to take over the pilot duties from 08886. By December 08633 was due an E exam, and on the 16th December it arrived back at Toton and placed into store. It wasn’t until February 2011 08633 was released back into traffic, leaving Toton for Hoo Junction on 10th February 2011. After a year at Hoo Junction, a C Exam was due and so a move to Crewe was completed before returning to traffic at Westbury in April 2012. However by June 2012 the loco was back in store having failed in service. Repairs were to be completed however, with a grand tour ensuing that took the loco to Doncaster, Margam, Port Talbot and Didcot before finally returning to Staffordshire - and the Axiom Rail Stoke site (the former Marcroft Wagon Works) by the A500/A50 Interchange. From here the loco has continued in service for EWS successor DB Schenke, across the tracks from where its career began at its first home 5D Stoke Shed some 57 years ago, before being sold for preservation now. 25322 “Tamworth Castle” is the North Staffordshire Railways Companies “celebrity” diesel locomotive, having gained fame for being the final BR Class 25 to see mainline service with British Railways. D7672 was one of the final six 25s to be built, being delivered new to traffic on 25th February 1967 at London Midland Region’s Nottingham depot in BR’s allover cooperate Blue livery. From here she spent her entire career allocate to various LMR depots, from as far North as Carlisle Kingmoor down to Bescot, also seeing service at Preston, Liverpool, Springs Branch (Wigan) and Crewe. In April 1974 the locomotive was given its TOPS number of 25322. In January 1984 ‘322 was withdrawn from traffic along with 25311 after their flask train caught fire. However in April ‘322 was selected for display at the upcoming Tamworth Rail Week, and so she was transferred to Tyseley Depot for repainting. She received a modified livery with full yellow cabs –nicknamed Ice Cream Van livery. Here she also gained the unofficial name of “Tamworth Castle” – railway myths suggesting the shed foreman at the time had a soft spot for the GWR Castle steam locomotives. After her appearance at Tamworth Rail Week from 12-20th May 1984, ‘322 was reinstated into traffic due to a shortage of locomotives and allocated to Bescot once more. In 1985 BR implemented its new “Sectorisation Plan”, creating a specialized pool of locomotives to handle specific traffic flows. 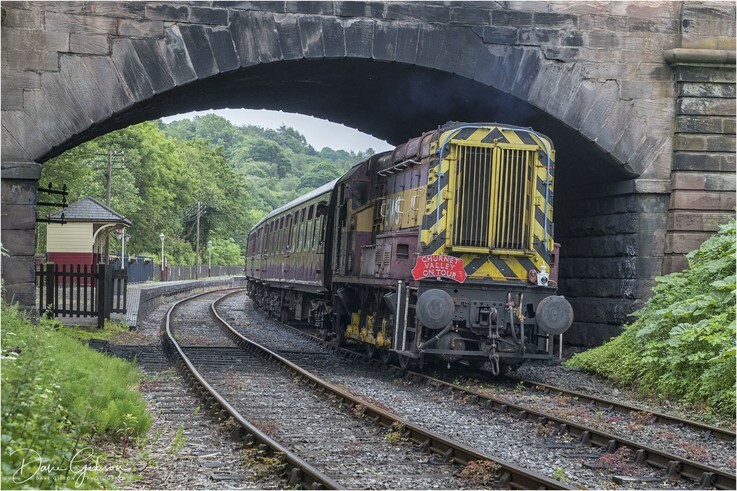 Carlisle Kingmoor Chemicals sub-sector received a dozen Class 25’s and the locomotives were given enhanced maintenance schedules and limited to 60mph to mitigate potential traction motor problems. 25322 became 25912, and joined the operational fleet in December 1985. However the special traffic flows diminished rapidly with some expected services never materializing. This saw the full project cancelled in 1987 and ‘912 was withdrawn from service on 23rd March along with all remaining Class 25s across the UK. Salvation was to come around once again however, as the locomotive was selected as a training tool entered departmental service as ADB968027 (though this number was never carried). Transferred to the Eastern Region’s depot at Leeds Holbeck on 15th April, the locomotive was repainted in BR two-tonne green as D7672 – despite never having carried this livery previously. This soon escalated into a full restoration by the training department, and spares were sourced from numerous withdrawn 25s at Bescot along with a set of miniature snowploughs from a Class 20. On 24th April 1989, an internal ceremony was held to mark the completion of the overhaul, and cast “Tamworth Castle” nameplates was fitted – making the loco the only class 25 to be named in BR service. Elesewhere BR had started operating “celebrity” locos on service trains in an attempt to increase passenger numbers. D7672 received an invite for one such train, and so a test run was completed to Skipton and back on 19th February 1990. The following day saw TC doublehead the 0825 Leeds to Carlisle with 47422 and the 1242 return working. TC became a popular request for charter trains plus Depot Open Day visits, and a commemorative plaque was received at Doncaster during an Open Day visit on 20th May to commemorate the Training Departments achievement in overhauling the locomotive. All this subsequently saw the locomotive re-enter BR traffic on 15th September, though it remained in use primarily on railtours and making open day appearances. BR’s finances came under scrutiny, and D7672 was seen as an unnecessary cost and so a final railtour from Leeds to Holyhead was arranged for 30th March 1991 before the locomotive was sold into private ownership. 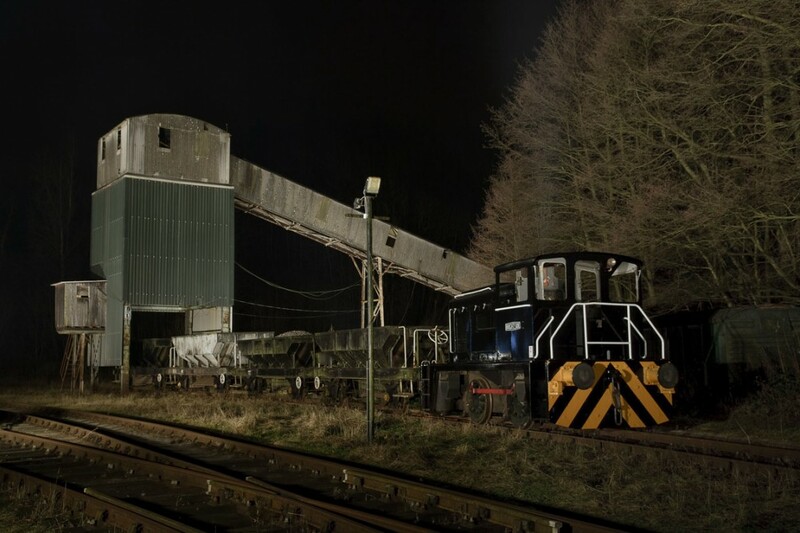 The successful bidder was the Churnet Valley Diesel Group, and following asbestos removal TC arrived at the group’s Cheddleton base in May 1991. However TC was far too big for the demonstration service operated at Cheddleton, and so TC went out on hire to various railways including the Kent & East Sussex Railway. TC then returned to Cheddleton in 1995, as the Churnet Valley Railway prepared for the launch of its heritage services, with the first operation to Leekbrook commencing in August 1997. TC joined the operational fleet and was able to stretch her legs as the CVR extended South to Kinglsey & Froghall. TC performed throughout the 90s along the CVR, but as the early 2000s dawned the repairs list started to mount. 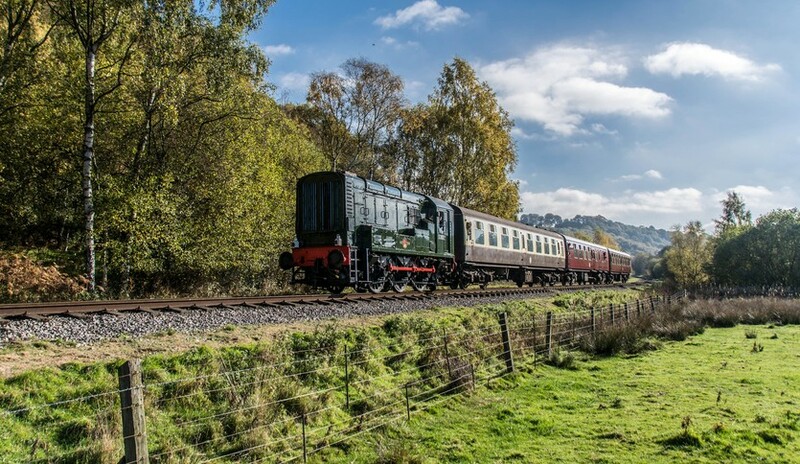 With the original members of the owning group having moved on elsewhere, ownership was transferred to the Churnet Valley Railway support charity (North Staffordshire Railway Company (1978) Ltd) and the original group dissolved. In 2009 - D7672 was repainted into her Ice Cream blue livery for a EMRPS photo charter and regained her original TOPS number of 25322. Since then TC has remained in store within Cheddleton Yard whilst funds are raised for all necessary repairs. These are expected to start once the overhaul of 47524 has been completed, though offers of support are always welcomed. The class 33 locomotives were built at the Birmingham Railway Carriage & Wagon Company works in Smethwick. 98 were built between 1960 and 1962. Fitted with a Sulzer 8 cylinder engine developing 1,550hp they were the first class of locomotive to be equipped with electric train heat from new and were also equipped with dual braking systems - vacuum and air. The North Staffordshire Railway Company's class 33 33102 was originally numbered D6513 and in 1967 was selected as one of 19 locos of the class to be converted to 'push-pull' mode. This was to enable them to handle services over the non-electrified section of line between Bournemouth and Weymouth. She was carrying BR Blue livery by this time and then in 1973 was renumbered to 33102 under the British Rail TOPS scheme and became part of Class 33/1 - indicating a push-pull fitted loco. She was withdrawn from mainline service in 1992, still carrying BR Blue livery, and by then had been unofficially named 'Sophie' by one of the depot staff at Eastleigh. 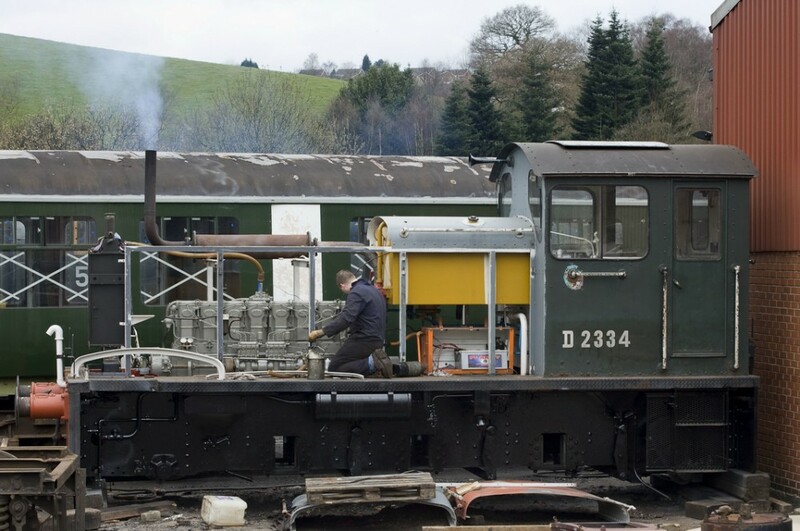 The North Staffs Railway Diesel Group based at the Churnet Valley Railway were successful in buying her through a tendering process in 1993 and she was moved to the railway in October of that year. Following considerable restoration work including the fitting of replacement bogies she entered service on the railway in 1997. By the end of 2009 'Sophie', now owned by the North Staffs Railway Co (1978) Ltd, was again in need of restoration and refurbishment. After a lengthy overhaul which included extensive body work, a rewire, new internal guttering and drains, replacement of cant rail grilles, complete strip down and overhaul of the compressor, new batteries and a complete repaint 33102 appeared in time for the CVR’s 2012 diesel weekend. 33021 was originally numbered D6539 and in 1974 the loco - now carrying BR Blue livery -was renumbered to 33021 under the British Rail TOPS scheme and became part of Class 33/0 - indicating a non push-pull fitted loco. 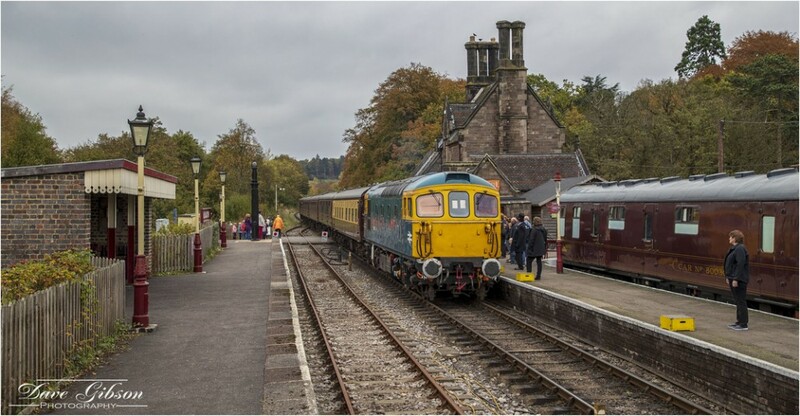 Withdrawn from mainline service in 1996 and then purchased privately and overhauled, carrying a Post Office Red type of livery, 33021 became one of the first privately owned diesel locomotives to be returned to use on the mainline. After a period out of use at Tyseley Depot the loco was again sold privately in late 2009, and following restoration and renovation, operated for the first time in more than 6 years in September 2010 at the Battlefield Line. 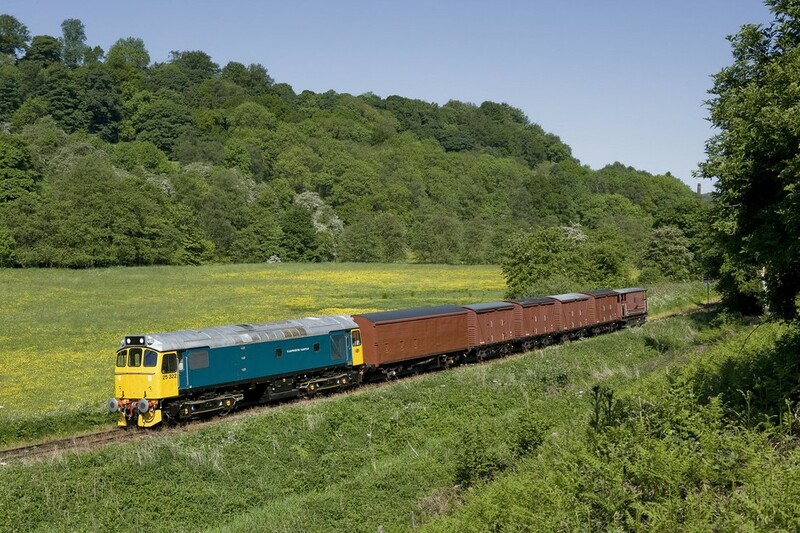 Later that year the loco, now back in BR Blue livery, moved to the Churnet Valley Railway and in July 2011 was named 'Captain Charles' and painted in BR Blue Bandit livery. The loco is currently undergoing a cab overhaul inside Cheddleton shed. The British Rail Class 47 is a diesel electric locomotive developed in the 1960s by Brush Traction. A total of 512 Class 47s were built between Crewe Works and Brush Works, Loughborough. They were fitted with a Sulzer 12LDA28C twin bank twelve cylinder power unit producing 2,750 hp - though this was later derated to 2,580 hp to improve reliability. 47524 was originally numbered D1107 and was a product of Crewe Works. It was released to traffic in December 1966. D1107 was allocated to York and remained based on the Eastern region. It became 47524 in 1974 and moved to Eastfield in Scotland in 1988 and then to Bristol in 1989 and finally to Crewe in 1991 becoming part of the parcels fleet. On September 23rd 1995 47524 was named Res Gestae at Didcot Railway Centre by Nobby Clark, a retired TPO employee. 47524 last worked on the 26th June 1996 when it took 1F52, 02:45 vans from Crewe to Liverpool Lime Street, returning light engine to Crewe. It was placed out of service later that day requiring attention to its exhaust system. It was later found to have high crankcase pressure and in addition has a suspect main generator bearing. The loco was withdrawn on 6th July 1996 having run for 8,202 engine hours since its last overhaul. Bought privately in 2002 and stored at Tyseley 47524 eventually moved to the Churnet Valley in October 2005 and work commenced on the restoration in late 2006. "No.6" was built by the Yorkshire Engine Co. of Sheffield in 1959 (works number 2748) for the NCB, and was allocated to their Littleton Colliery in Staffordshire, where it was given their plant no 63/000/320. The loco was preserved and moved to the Buxton site of Peak Rail in July 1988 and returned to service. The loco moved to Darley Dale in May 1989 and was regularly used on the works trains towards Matlock in 1989 & 1990 - in 1993 it continued in use on the trains to Rowsley. The loco was sold in July 1993, and by March 1994 had returned to Industrial use at Cooper’s metals in Attercliffe, just a few miles from where it was built. The loco was purchased in February 2003 and moved to Riversway in Preston, with the intention of the loco becoming the mainstay of the Ribble Rail loco fleet to operate the bitumen trains along the dock. Chosen due to her suitable ease of maintenance and power capability, the loco was named “Perseverance” and was to work alongside “Energy”, “Enterprise” and “Progress” on the docks hauling revenue earning trains. A full overhaul and repaint was carried out by the railway in preparation for the hard work in store for the loco, however there was a troublesome electrical issue which plagued the loco and so it was placed into storage in the Ribble museum building. “No 6” was eventually purchased by the NSRC from Ribble Rail using proceeds left from the legacy of Roger Bennett, a volunteer on the CVR within the diesel department. The loco arrived on the Churnet Valley line in January 2008, and was named “"Roger H Bennett"” after the benefactor who helped pay for the acquisition. Like “No 6”, Roger himself spent time working at Peak Rail before coming to the Churnet Valley Railway.